This cake was (somewhat obviously, right?) supposed to go up for Memorial Day. And then for July 4th. Because duh. 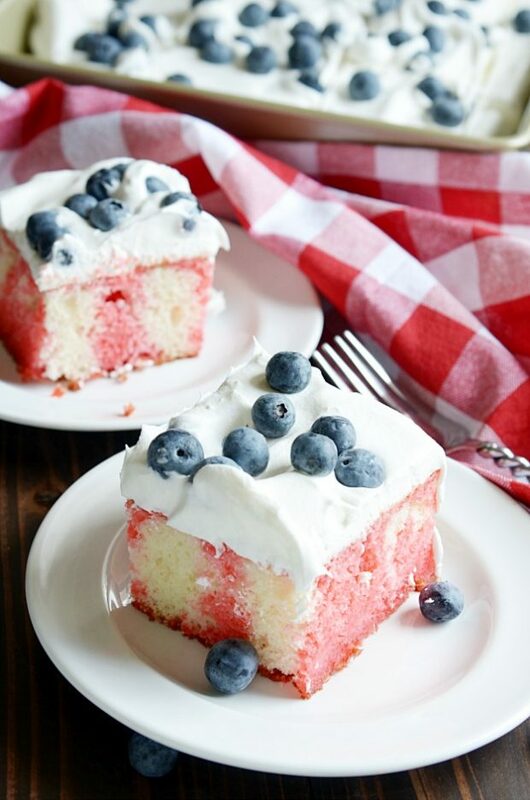 It’s the perfect Red, White, and Blue solution to all of those potlucks, BBQs, and family get togethers! But now it’s July 18th. So…. 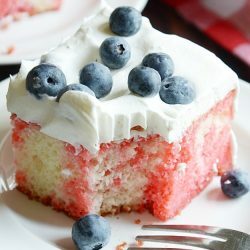 I guess this is a Red, White, and Blue July 18th cake. But you know what? I say there are worse things in life than late cake. 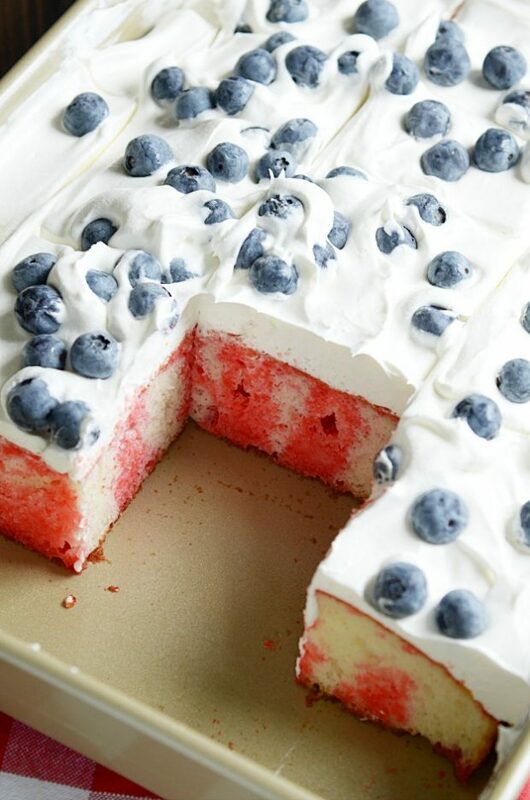 And, really, I think this country could use a little more patriotism in the form of cake ????. So, I’m just gonna call this my fulfilling my civic duty and leave it at that. Mmkay? 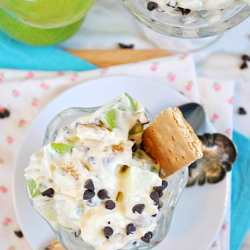 So, Jell-O Poke Cake. Have you had it before?? Probably. 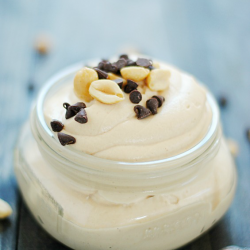 It’s wildly popular in the summertime, and for good reason. 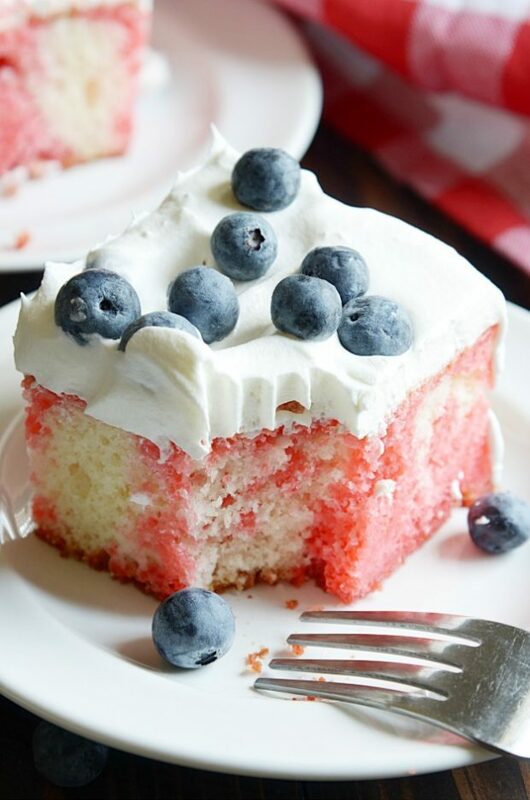 Soft, white sheet cake is soaked in strawberry Jell-O– but not like in a weird gelatinous way, like a yummy soaked cake kind of way… if that makes sense– smothered in Cool Whip, and topped with blueberries. Of course, you could change this up a million different ways and make it exactly however you’d like it. You could add any kind of berries or cherries on top. Or nothing at all. You could use orange Jell-O or cherry or lemon! You could use yellow cake or confetti cake or one of those crazy blue raspberry cakes! The sky is literally the limit here. Maybe you’ve had the cake. If you’ve been to a potluck in the past 20+ years, then odds are good on that one. But did you know how crazy-stupid EASY this cake is to make?? Start with a cake mix. YES. A cake mix. 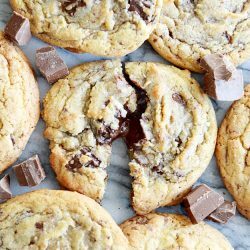 And you don’t have to do anything wacky to it or add any new ingredients. Just make it exactly like it says on the box. Then use the end of a wooden spoon and poke a bunch of holes all.over.the.cake. After that, you mix the Jell-O mix with hot water and pour it in the holes. Top with Cool Whip and chill! A few hours later, you have a ridiculously delicious and beautiful cake that people will go nuts over. Enjoy! And Happy July 18th! ???? Make the cake according to the directions on the box for a 9x13 cake. Let cool completely. 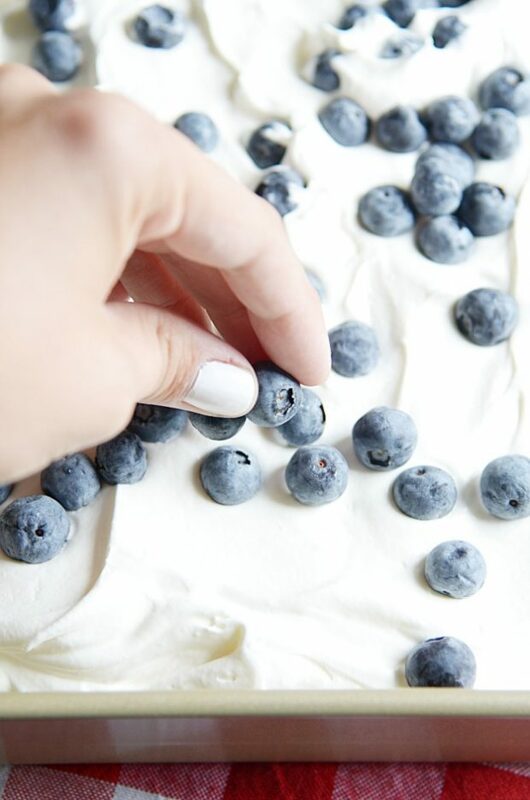 Use the bottom end of a wooden spoon to poke holes all over the cake. The more the better. Mix the boiling water with the Jell-O mix until the mix has dissolved. Mix in the cold water. IMMEDIATELY pour the mixture over the cake, aiming to fill the holes as much as possible. 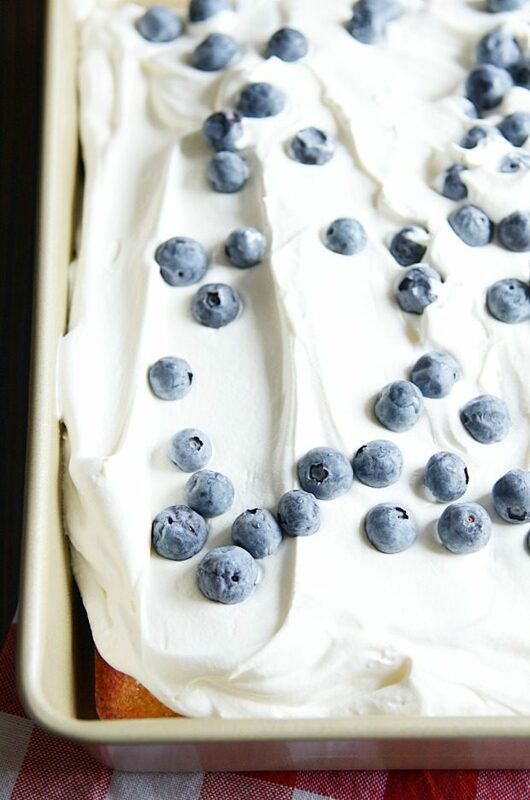 Cover with Cool Whip and garnish with berries before serving (it's best if the cake can chill for an additional hour after the Cool Whip has been added).